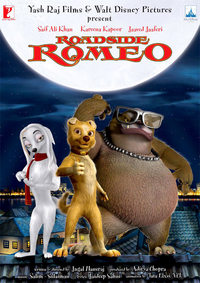 Review Summary: It might glimmer during the festive week but this Romeo is unlikely to rule the hearts of kids or kids at heart. This is at once the film's funniest -- and scariest, depending on which way you look at it -- moment, and says more than any review can, really. Eventually, it is a Hindi movie that just happens to be animated. Still Roadside Romeo is a leap ahead for Indian animation - hopefully more soaring cinema will follow. Take the kids, only if they insist. Roadside Romeo, we are told, lived with a wealthy family that abandoned him when they moved city. Watch out this film for the beautiful climax and for some state-of-the-art animation that hadn't reached desi cinema till now. It might glimmer during the festive week, but this Romeo is unlikely to rule the hearts of kids or kids at heart. It might glimmer during the festive week but this Romeo is unlikely to rule the hearts of kids or kids at heart. Problem is that this sort of a spoofy effort has been seen before in any number of live action films and TV comedy shows. The animation is marvellous, if only the rest of the film could have kept pace too.